Before moving to the greater Philadelphia area, which has a huge Irish population, I was unaware of the existence of Irish soda bread—or other authentic Irish traditions like "Irish Potatoes," corned beef sandwiches with sauerkraut, and Shamrock Shakes. Okay, I'm just kidding about the Shamrock Shakes. And to be fair, Irish Potatoes aren't Irish either—they're...Philly-ish. Not really sure about corned beef. It seems like there might be some contention as to whether that's an Irish tradition, or an American one...or possibly even an English one. The very fact they eat it with sauerkraut might even give the Germans some stake in the matter, and...well, I've digressed far enough already. But, Nathan, you say—with your extreme whiteness, red features, and "MacFarland" for a middle name, aren't you super Irish? No. I'm not. I mean, not strictly. On one side, I'm descended from Scottish Presbyterians that lived in Northern Ireland for some time in order to persuade the stubborn Irish that the King of England wasn't really that bad and that the Pope in Rome wasn't really that great, and that shaving off a third of their island was a small price to pay to avoid having their butts kicked repeatedly by the Brits. So...Irish in a sense, yet probably not at all popular with proper Irish folk. And now that I've publicly made myself a target for the IRA, here ends the digression. I promise this time. A clever play on the words "Blarney Stone," this loaf of high-rise bread is not a true scone, at least not in the sense that I think of. 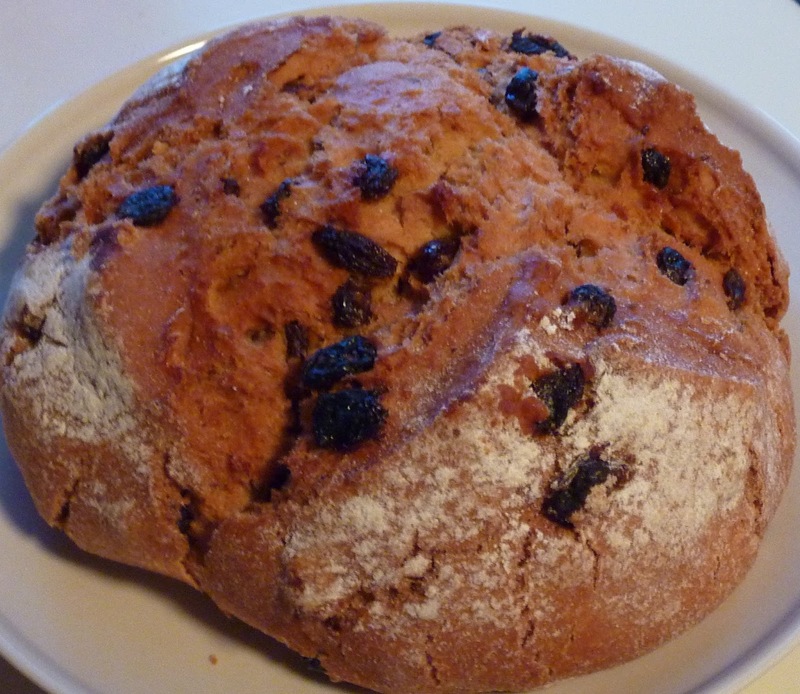 It's not particularly sweet, except for the raisins scattered throughout the bread. It's not at all like "raisin bread" either, in that there's no cinnamon and very little sugar. It tastes similar to rye bread to me—but with no marbling of any kind. What makes it "soda bread" is the presence of baking soda as a rising agent, rather than yeast...and it might be my imagination, but I want to say you can taste that difference pretty clearly. It's nothing spectacular in the flavor department, but not at all unappealing, either. Texture-wise, it's a nice, soft bread, but very crumby. Too crumby. It was extremely difficult to cut individual pieces off of the loaf, and nearly impossible to place said pieces in a traditional toaster without losing most of the bread to the fiery recesses of the sweltering appliance. I enjoyed just grabbing chunks from the sizable 10-serving "scone" and eating them plain. I must say, it goes well with cream cheese too, if you're craving a bit more flavor. The $4 loaf was a decent value and fun to try, although don't expect anything super exciting in tastebud-land. This isn't really a dessert. Double 3.5's and Happy St. Patrick's Day! I've eaten soda bread all my life and this is a fail for TJs. It's just not very good soda bread. Yeah I've heard mixed things from people more familiar with soda bread. If you've eaten it your whole life, then you're definitely more of an expert than I am. I do appreciate the comment! I was cracking up with your part about your extreme whiteness and red features lol. I so enjoy checking your blog and seeing a new post! 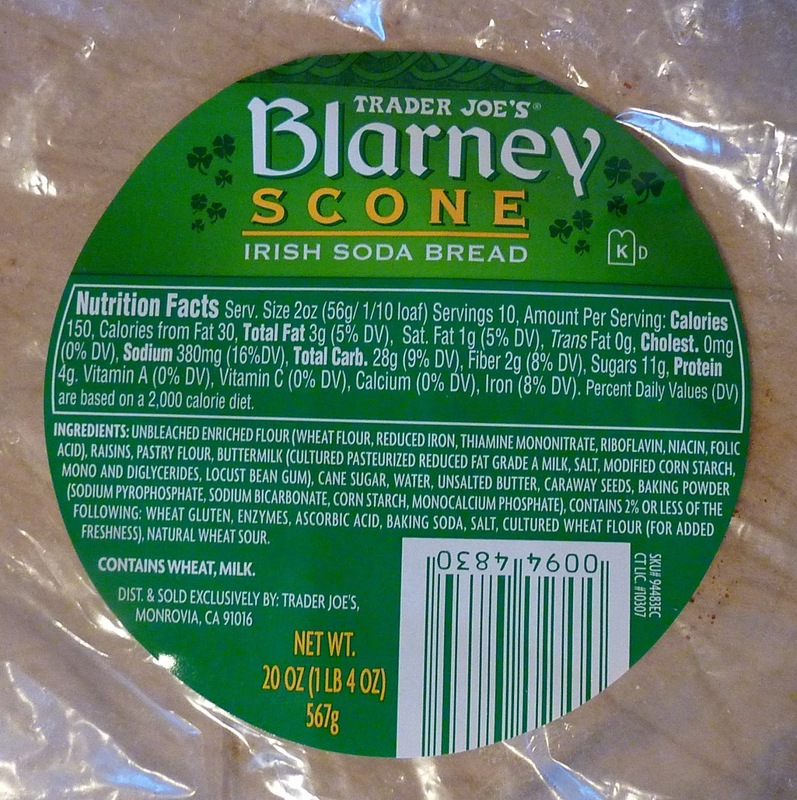 Upon clicking on this blog post, I had absolutely no clue what a Blarney Scone was! Minus the raisins, it sounds like an interesting concept, but seeing as though you were not too impressed, I think I may have to pass on it. Thank you for the review! I guess everyone has different tastes. I enjoy the bread and I've had quite a bit of soda bread over the years. I prefer it untoasted with a little of their salted butter. So happy I found it! Please, please, please...not St. Patty's Day. Patty is a woman's name. If you want to refer to the patron saint of Ireland familiarly, it's Paddy. As in the Irish Padraig..
As for your ancestors, it wasn't quite so funny or benign.